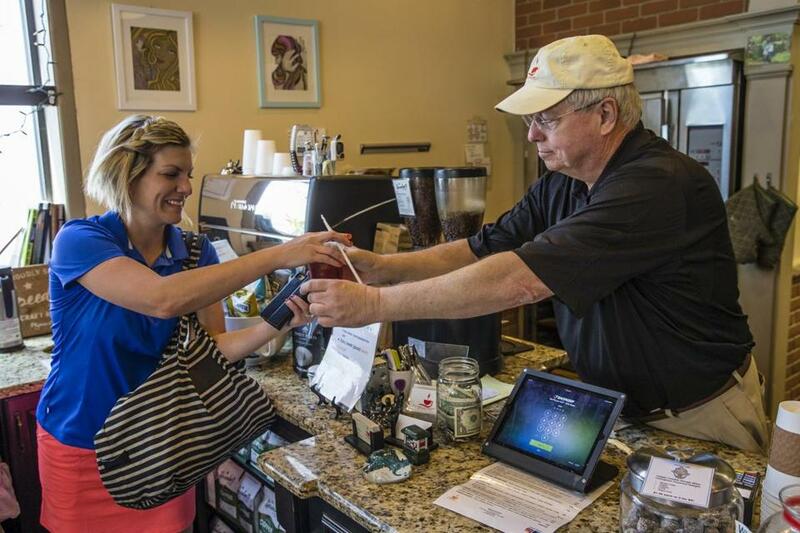 Justin O&apos;Connor handed a customer an iced coffee as he worked in the Fuller Cup coffee shop in Winchester. It’s late afternoon at the Venture Café in Cambridge’s Kendall Square. The tables are teeming with techies in T-shirts, sipping beer and pecking on laptops. Everybody works for a startup, every startup is hiring — now or soon — and every new hire seems younger than the last. “I’m feeling old,” jokes Xhulia Bratja, a manager at a fledgling data analytics firm, who turns 25 this week. Eight miles north, Justin O’Connor, 65, pours coffee for customers at the cozy Fuller Cup in Winchester. O’Connor, a longtime supply chain manager for telecom companies, hasn’t worked full time in his field since he was laid off in 2010. A decade after the 2008 recession, the Boston area and many other parts of the United States are experiencing the tightest labor market in recent memory. But some older workers say even the pressure of a 3.9 percent jobless rate isn’t enough to overcome the age bias they believe has wrecked their prospects in the fields where they built their careers. Many of them, like O’Connor, are tech workers who were laid off in the aftermath of the recession and have struggled to find similar jobs with comparable pay. “They don’t value your experience,” said Arnie Bearak, 63, a longtime software developer from Needham. He lost his job at Comverse Technology in Wakefield in 2007 and has been looking for full-time employment while working on and off at contract jobs. Later this year, the Baker administration will launch a new program aimed at boosting the fortunes of older workers. It plans to make Massachusetts the first state to give “age-friendly” stamps of approval to employers that hire people of all ages — and that have policies, such as flexible hours and family leave, benefiting workers across the age spectrum. As part of the effort, state officials hope to post a list of age-friendly employers on a website for full-time or part-time job-seekers. Some employers, especially in the health care and nonprofit sectors, already view older workers as untapped resources who can bring highly developed skills and strong work ethics to their organizations. For example, more than a third of the 2,600 employees at Tufts Health Plan in Watertown are over 50. “If we’re not tapping into the whole workforce, we’re handicapping ourselves,” said Lydia Greene, the health insurer’s chief human resources officer. Advocates and researchers say older workers are passed over for a number of reasons. Employers are afraid their skills aren’t up-to-date, or that older workers will demand higher wages and boost health insurance costs because they’re more likely to get sick. And stereotypes are rampant: Older people can’t learn new things, aren’t good with technology, and reject new ideas. “These perceptions have somehow invaded our workplace, and it’s hard for people to unlearn them,” said Doug Dickson, board chair of Encore Boston Network, a group that helps people over 50 find work, chiefly in the nonprofit sector. Older workers displaced during the recession were projected to earn 14 to 19 percent less for the remainder of this decade, according to a 2013 report by the Center for Retirement Research at Boston College. Because many take contracting jobs without benefits or string together part-time gigs, they don’t show up in jobless data but consider themselves underemployed. Whether the state’s age-friendly push and the demands of growing businesses can help them recover their former salaries and responsibilities is far from clear. In the high-tech startup world, many early-stage companies are infatuated by youth and “disruptive” technologies meant to upend traditional markets, practices, and workplaces. Typical of the new breed of fast-growing tech startups is Drift, which develops enterprise software using chatbot-style messaging. The venture-backed company, based in Boston with a San Francisco office, has an open office plan where workers bang a gong to celebrate sales and free lunch is brought in daily. Its Instagram feed features a snapshot of fresh-faced new hires. Recruiting director Keith Pescosolido said Drift values diversity and is open to hiring people of all ages. But while “help wanted” postings from early-stage companies are proliferating on online job sites, many older workers say that they haven’t been able to capitalize on them. Information technology veteran Lisa Spang, 66, who’s sold everything from personal computers to investment software, lost her full-time job at Wellesley Information Services in 2008. Since then, she’s had multiple contracting jobs — stints that are short-term and don’t come with benefits — while working nights at Lord & Taylor in the Burlington Mall. Spang, a Woburn resident, wants to work full time again but thinks her resume gets screened out by digital application systems programmed to favor younger workers. When she does get interviews, Spang feels as though her age is a deal-breaker. At a technology publishing company, Spang said, she was asked by one interviewer how she’d feel about being the “most experienced” person on the payroll. The drill has been much the same for Bearak, the Needham software developer. In recent years, he said, his work life has been a “roller coaster” of contract jobs. Bearak said his proficiency with computer programming languages from earlier decades now works against him, marking him as a relic from an earlier era. Tim Driver, chief executive of Waltham jobs site Retirementjobs.com, who cochairs the state working group promoting age-friendly employers, says it’s time for attitudes to change.